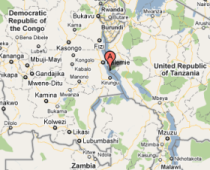 Zambia ( /ˈzæmbiə/), officially the Republic of Zambia, is a landlocked country in Southern Africa. The neighbouring countries are the Democratic Republic of the Congo to the north, Tanzania to the north-east, Malawi to the east, Mozambique, Zimbabwe, Botswana and Namibia to the south, and Angola to the west. The capital city is Lusaka, located in the south-central part of the country. The population is concentrated mainly around the capital Lusaka in the south and the Copperbelt to the northwest. Originally inhabited by Khoisan peoples, the region of what is now Zambia was reached by the Bantu expansion by ca. the 12th century. After visits by European explorers starting in the 18th century, Zambia became the British colony of Northern Rhodesia towards the end of the nineteenth century. For most of the colonial period, the country was governed by an administration appointed from London with the advice of the British South Africa Company. On 24 October 1964, the country declared independence from the United Kingdom and Prime Minister Kenneth Kaunda became the first head of state. Zambia was governed by Kenneth Kaunda of the socialist United National Independence Party (UNIP) from 1964 until 1991. From 1972 to 1991 Zambia was a one-party state with UNIP the sole legal political party. From 1991 to 2002, Zambia was governed by president Frederick Chiluba of the social-democratic Movement for Multi-Party Democracy during which the country saw a rise in social-economic growth and increased decentralisation of government. Levy Mwanawasa was the third President of Zambia. He presided over the country from January 2002 until his death in August 2008. He is credited with having initiated a campaign to rid the country of corruption, and increasing standards of living from the levels left by Frederick T.J. Chiluba. September 2011, Michael Chilufya Sata was sworn in as the fifth Zambian President. He defeated Movement for Multi-Party Democracy candidate and the President Rupiah Banda and eight other presidential aspirants in tripartite elections. The World Bank in 2010 named Zambia as one of the world's fastest economically reforming countries. The headquarters of COMESA are in the capital Lusaka. Zambia is a landlocked country in southern Africa, with a tropical climate and consists mostly of high plateau, with some hills and mountains, dissected by river valleys. At 752,614 km2 (290,586 sq mi) it is the 39th-largest country in the world (after Chile) and slightly larger than the US state of Texas. The country lies mostly between latitudes 8° and 18°S, and longitudes 22° and 34°E. Zambia is drained by two major river basins: the Zambezi basin in the south covering about three-quarters of the country; and the Congo basin in the north covering about one-quarter of the country. A very small area in the northeast forms part of the internal drainage basin of Lake Rukwa in Tanzania. Eastern Zambia shows great diversity. The Luangwa Valley splits the plateau in a curve north east to south west, extended west into the heart of the plateau by the deep valley of the Lunsemfwa River. Hills and mountains are found by the side of some sections of the valley, notably in its north-east the Nyika Plateau (2,200 m/7,218 ft) on the Malawi border, which extend into Zambia as the Mafinga Hills, containing the country's highest point, Kongera (2,187 m/7,175 ft). The Muchinga Mountains, the watershed between the Zambezi and Congo drainage basins, run parallel to the deep valley of the Luangwa River and form a sharp backdrop to its northern edge, although they are almost everywhere below 1,700 m (5,577 ft). Their culminating peak Mumpu is at the western end and at 1,892 m (6,207 ft) is the highest point in Zambia away from the eastern border region. The border of the Congo Pedicle was drawn around this mountain. The southernmost headstream of the Congo River rises in Zambia and flows through its north firstly as the Chambeshi and then, after the Bangweulu Swamps as the Luapula, which forms part of the border with the Democratic Republic of the Congo. The Luapula flows south then west before it turns north until it enters Lake Mweru. The lake's other major tributary is the Kalungwishi River, which flows into it from the east. The Luvua River drains Lake Mweru, flowing out of the northern end to the Lualaba River (Upper Congo River). The climate of Zambia is tropical modified by elevation. In the Köppen climate classification, most of the country is classified as humid subtropical or tropical wet and dry, with small stretches of semi-arid steppe climate in the south-west and along the Zambezi valley. The Zambian shoreline of Lake Tanganyika is characterised by impressively steep walls of the southern Rift Valley. It includes Kalambo Falls, which is one of the tallest waterfalls in Africa. It also encompasses several river deltas and wetlands, as well as Nsumbu National Park, which are vital areas for biodiversity conservation. Although the Zambian part of Lake Tanganyika is relatively small (16.000 km2, which is 7% of the total catchment area), rivers in the southern basin are estimated to deposit up to 1500 tonnes of sediment into the lake per day. The excessive sedimentation is caused by environmentally unsustainable utilisation of land and forestry resources in the catchment, particularly in the Kaputa and Mpulungu Districts. Local communities largely depend on subsistence agriculture and fishing for their livelihoods. They have no means or capacity to diversify into other livelihood systems, and often end up in a vicious circle of land degradation and increased poverty. The UNDP/GEF Project on Lake Tanganyika aims to pilot innovative strategies for sustainable catchment management in the Kaputa and Mpulungu catchment areas, diversify livelihood options, and strengthen local governance capacity. The Zambian Component of the UNDP/GEF Project on Lake Tanganyika is implemented by a national Project Management Unit (PMU), under coordination of the Ministry of Tourism, Environment and Natural Resources (MTENR). A total of 11 sites were identified for catchment management demonstration sites in the Kaputa and Mpulungu Districts, and in total 44.5 hectares of agroforestry and native trees have been planted. The PMU facilitated the establishment of Village Conservation Development Committees, and the formulation of Natural Resource Management Plans and functional by-laws to promote sustainable agriculture and forestry management. Capacity building and training sessions were organized, covering subjects relevant to low input agriculture, mitigation measures against sedimentation, business and leadership skills. In total, 1853 individual farmers received training. As a result of project activities, increasing numbers of households are practicing sustainable land use (currently 46% of households within the project area). Furthermore, the project is successfully engaging stakeholders in alternative Income generating activities aimed at reducing environmental stress. In total, 837 households are involved in activities such as bee keeping, aquaculture with native fish species, and vegetable gardening. A revolving fund was successfully established to allow diversification of livelihoods. During the 2009-2010 agricultural season, 100% of loans provided under the fund were repaid. Average annual income of women who participated the revolving fund increased from USD 157 to USD 3,125. The Kalambo River drops 235 meters from the Rift wall at Kalambo Falls. It is also one of the most important archeological sites in Africa, and has produced a sequence of past human activity stretching over 250.000 years.